When tire inflation pressures are maintained within the specified limits (par. 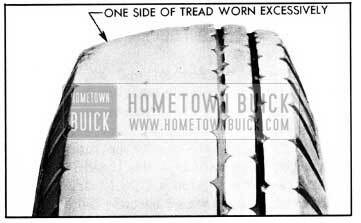 6-8) the tire will make a full contact across the entire width of tread, thereby distributing the wear evenly over the total surface of the entire tread area. When the front wheels have an excessive amount of either toe-in or toe-out, the tires are actually dragged sideways when they travel straight down the road, and cross wear or scraping action takes place, rapidly wearing away the tread of tires. 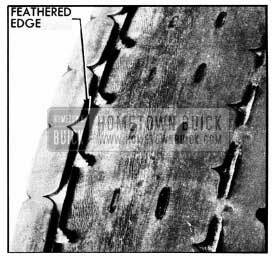 This cross wear condition will usually produce a tapered or feathered edge on the ribs of the tire tread. See figure 6-11. In most cases this can be detected by rubbing the hand across the tire tread. 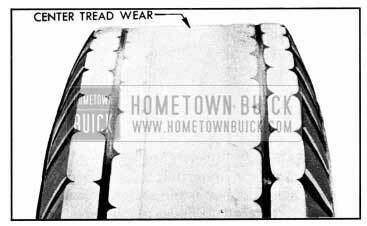 Heel and toe wear is not so prevalent on the rear tires because of the propelling action which creates a counteracting force which wears the opposite end of the tread block. 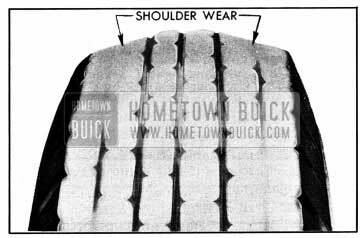 These two stresses on the rear tires wear the tread blocks in opposite directions and result in more even wear, while on the front tires the braking stress is the only one which is effective. This may be counteracted by interchanging tires (par. 6-8). Wabble or runout of a tire, either front or rear, due to bent wheel or to tire being improperly mounted will cause uneven wear. 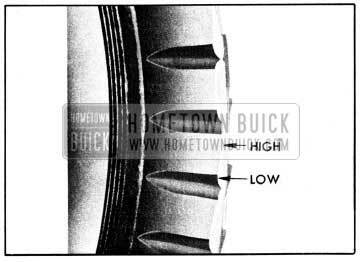 The runout of wheel and tire when rotated should not exceed 1;8″ at side of tire. Measurement of the trim dimension with springs installed is the only practical method of checking chassis springs that are reported . to be weak. 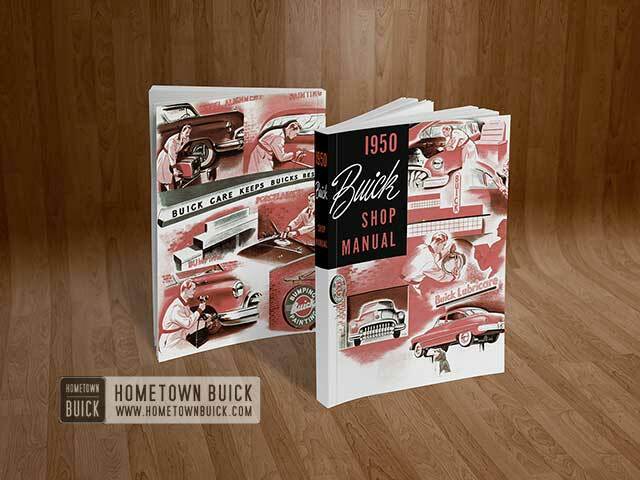 See paragraph 6-17 for checking trim dimension of front springs and paragraph 6-20 for rear springs. The strength of chassis springs cannot be determined by measurement of the free length when removed from car, because springs of equal strength under rated load may vary considerably in length when not loaded. Before attempting to test shock absorbers make sure that all attaching bolts are tight and that the units are filled with specified fluid (par. 6-23). 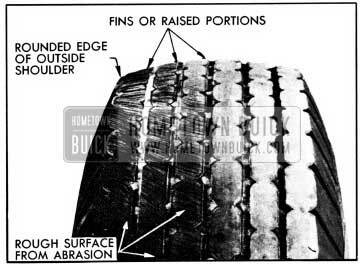 Tires should be uniformly inflated to specified pressure (par. 6-8). The chassis should be well lubricated to make sure that suspension parts are free moving. Lack of resistance to movement of the arm indicates air in shock absorber, internal leakage due to wear, or that the valve is held open by dirt. Excessive resistance indicates that bleeder hole in valve is plugged with dirt. Air may be worked out of a shock absorber by removing filler cap and moving the arm up and down through full range and adding fluid as described in paragraph 6-23. If a valve is plugged or held open by dirt, or internal leakage due to wear exists, the shock absorber must be removed for replacement of valve or shock absorber assembly (par. 6-24). Steering action is dependent upon the chassis suspension members as well as the steering gear assembly and tie rods. Improper steering actions which are most likely to be caused by chassis suspension are covered in this paragraph, while conditions most likely to be caused by the steering gear assembly or tie rods are covered in paragraph 7-3. Brakes dragging on one side (par. 8-7) . ( 5) Incorrect or uneven caster or camber (par. 6-30). Shock absorbers inoperative or leaking (par. 6-10). Wrong valving (par. 6-1).